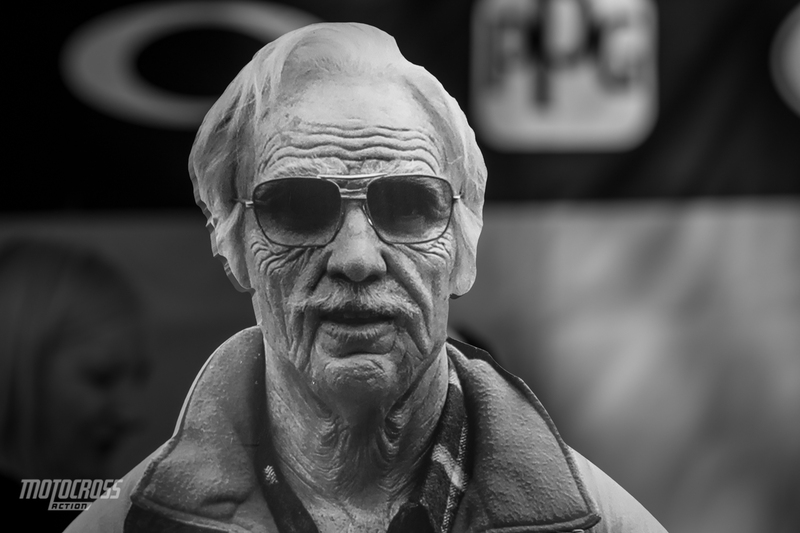 Grandpa Earl watching over the Wilson pits. 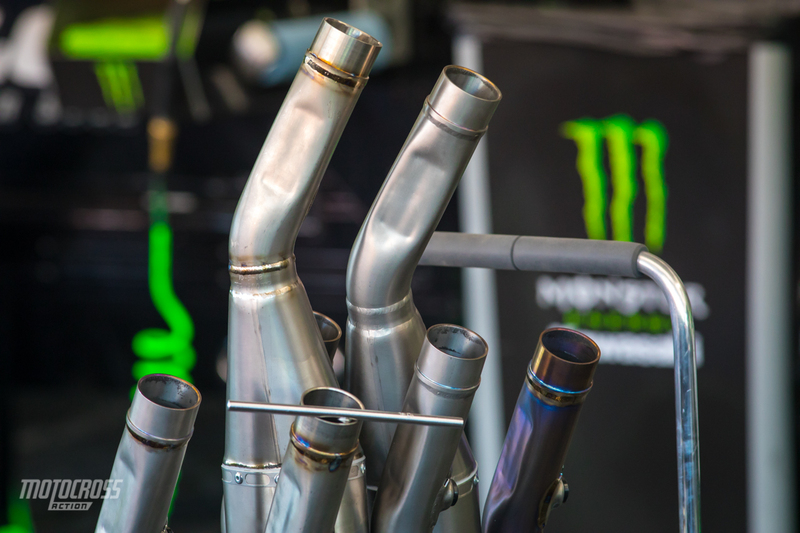 The fourth round of the 2019 AMA Monster Energy Supercross series is hosted in Oakland, California — inside the Raiders Stadium. It is also the stadium where the Athletics play. 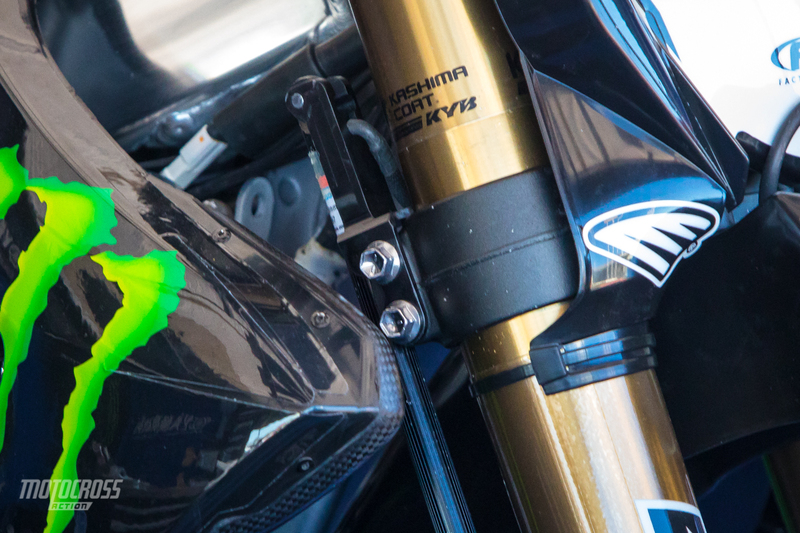 With three different winners in each class in the last three rounds, it has made this year’s racing interesting to say the least. 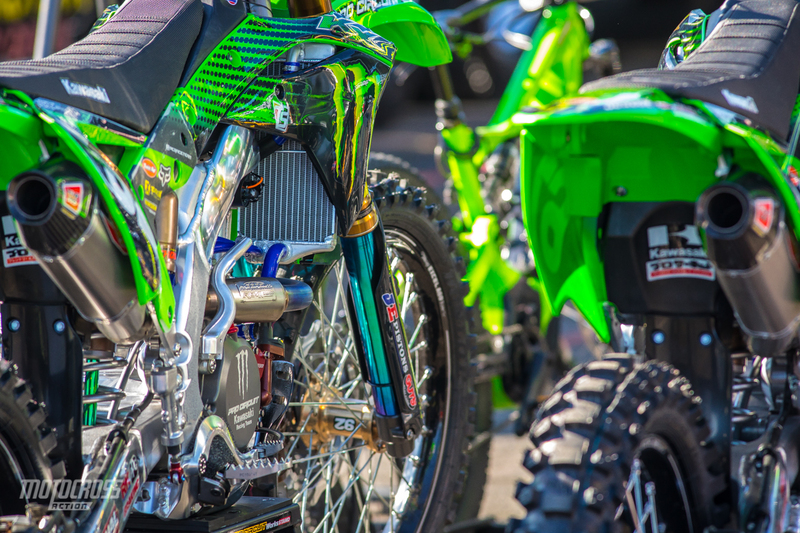 We got to Oakland early so we can give you a sneak peak into the secrets, the bikes and the people of Supercross . 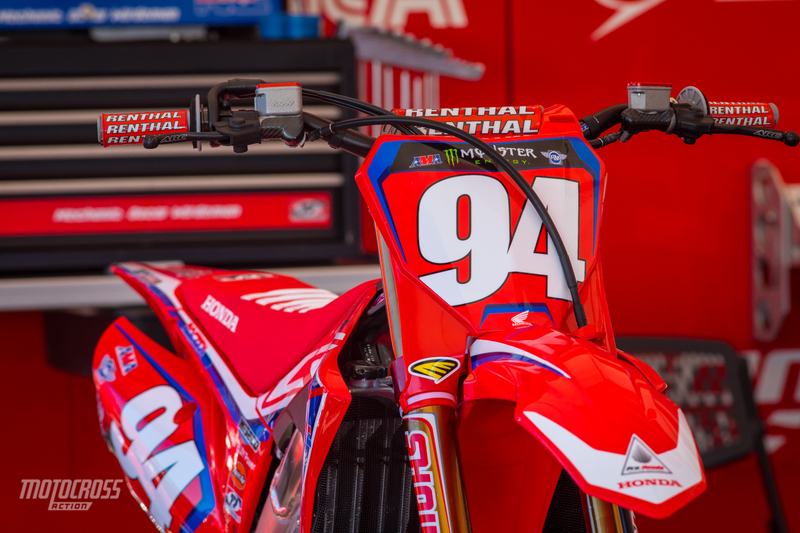 Ken Roczen has stayed consistent thus far in the series which is working for him. 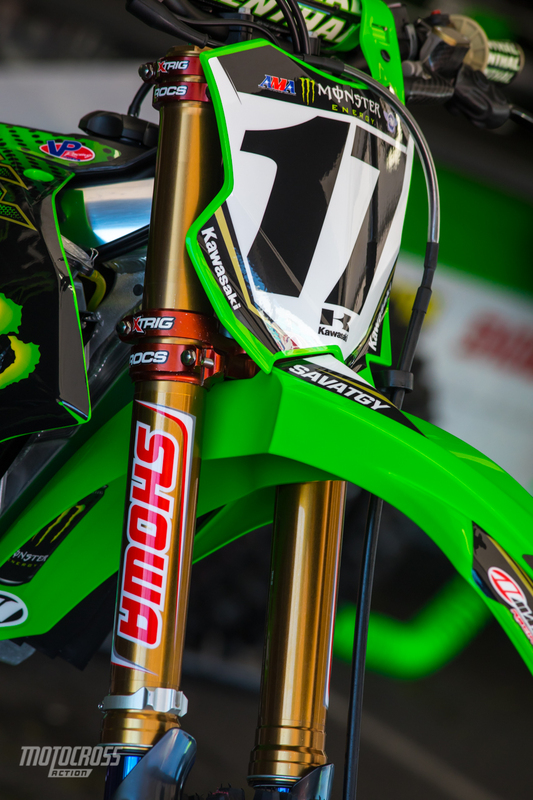 He holds the points lead by two points over Eli Tomac going into Oakland. 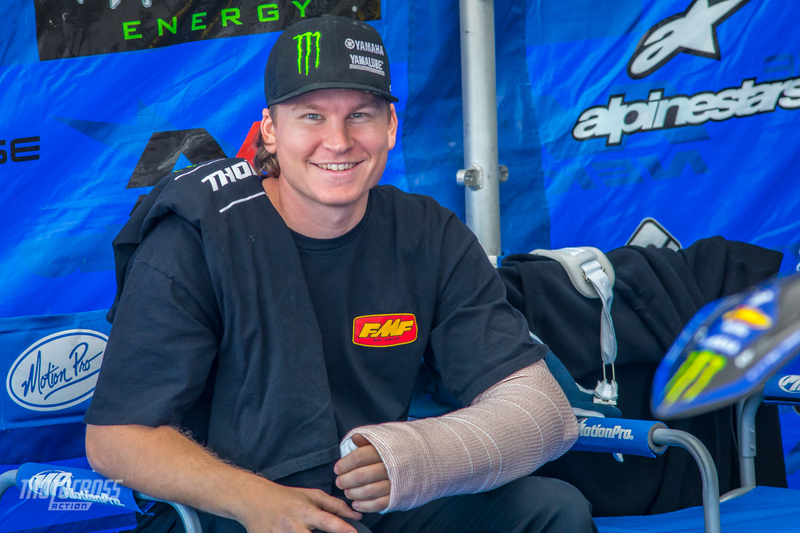 Dylan Ferrandis’ mechanic, Adam Campbell broke his elbow this week at the shop. 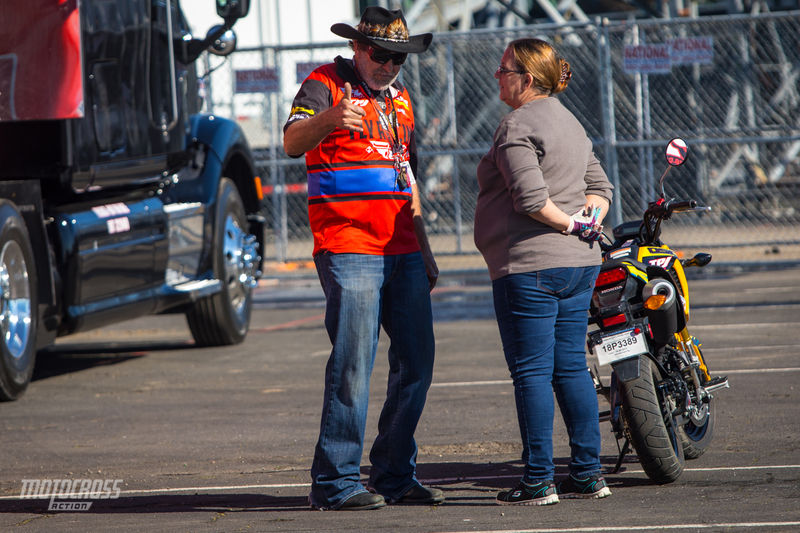 That isn’t going to stop him from trying to be there for his rider. 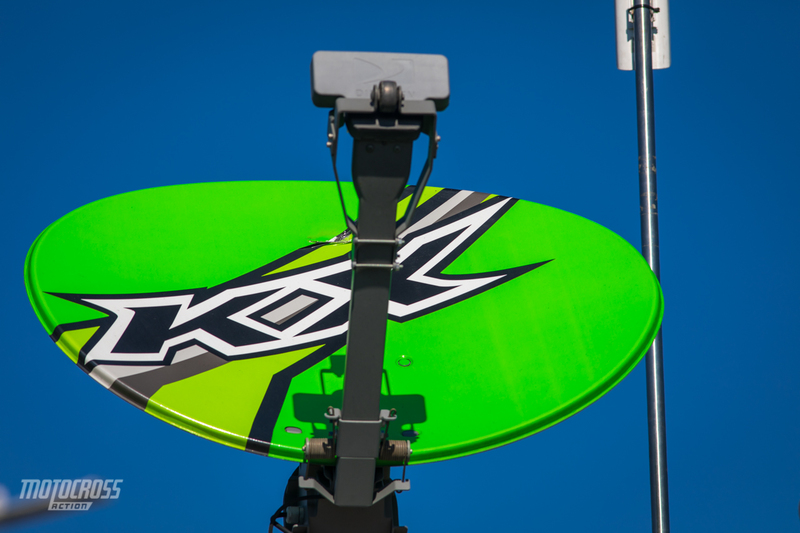 Wonder what channels you can get with the KX satellite. 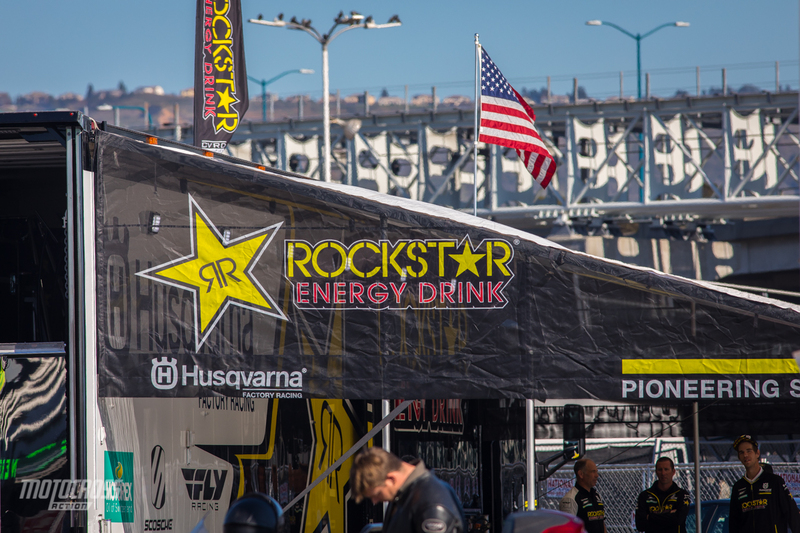 The Rockstar guys had a rough morning as their rental car got broken into and all their belongings were stolen. No more clothes, toiletries or laptops. 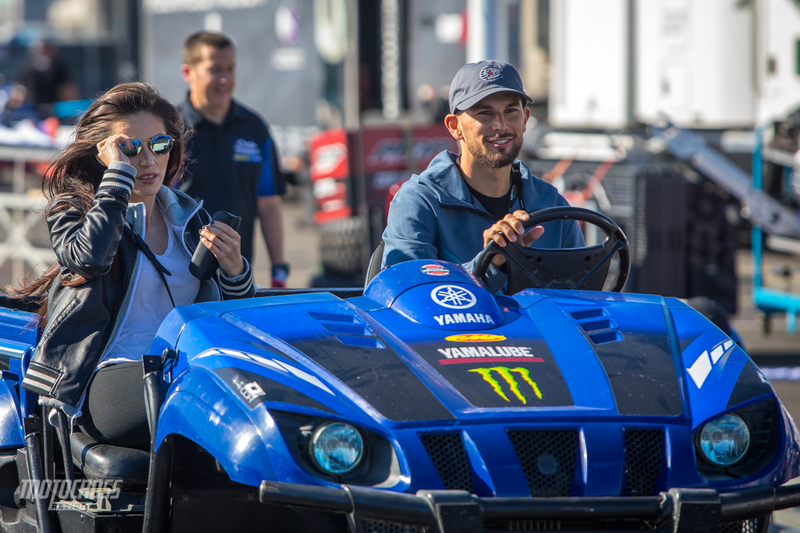 Colt Nichols rolling around in the Star Yamaha pit car. 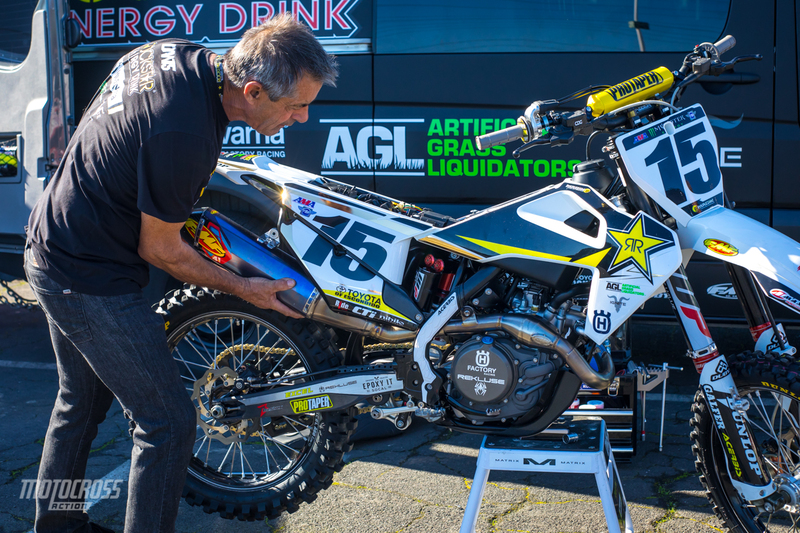 Dean Wilson’s dad putting the finishing touches on his FC450. 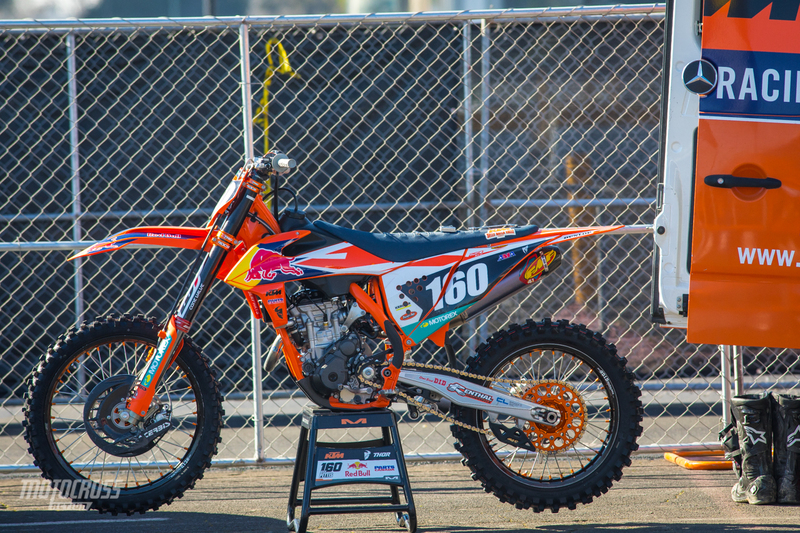 Cooper Webb put on an amazing performance last weekend at Anaheim 2 on his factory KTM 450SXF. 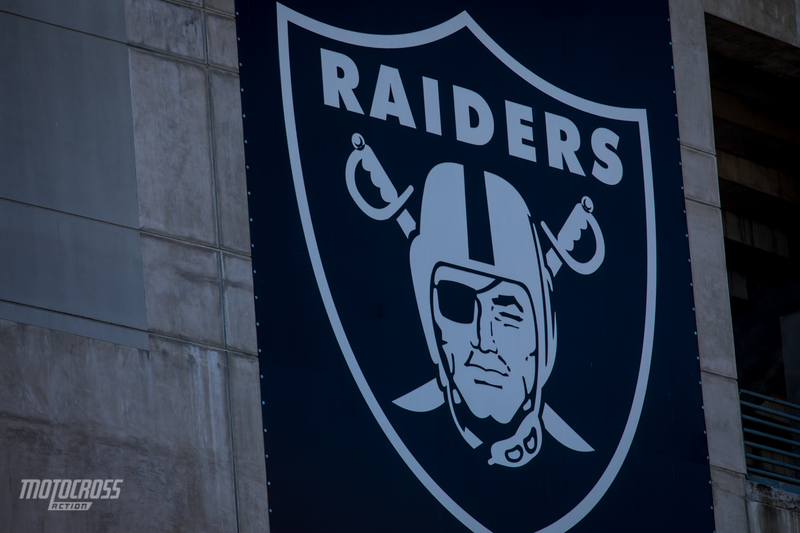 Will he be able to do it again in Oakland? 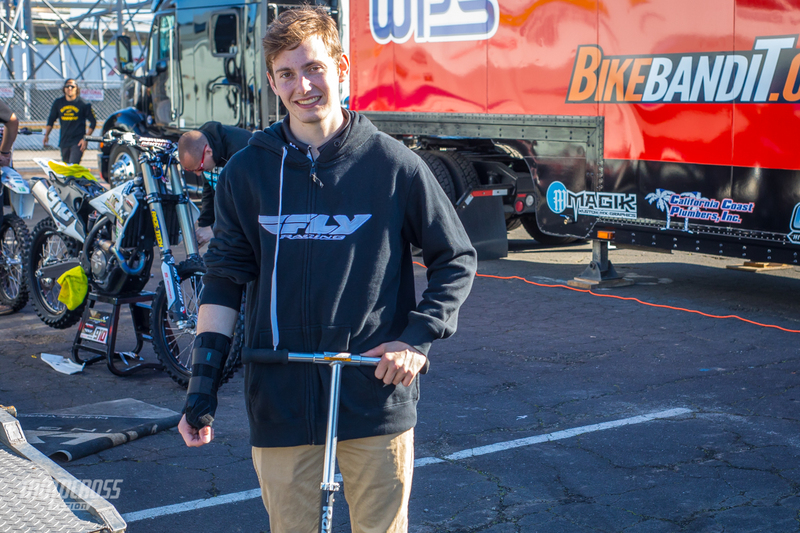 Carson Brown found out he has been racing with a broken navicular in his wrist. 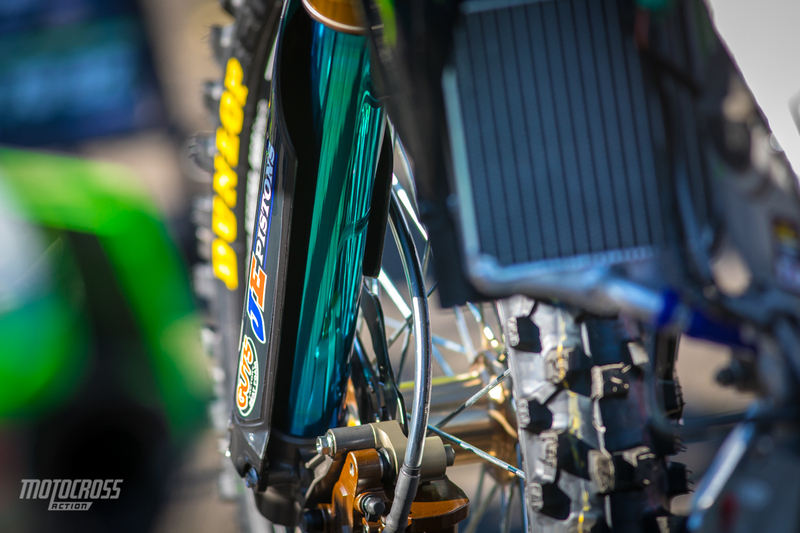 That isn’t stopping him from racing tonight. 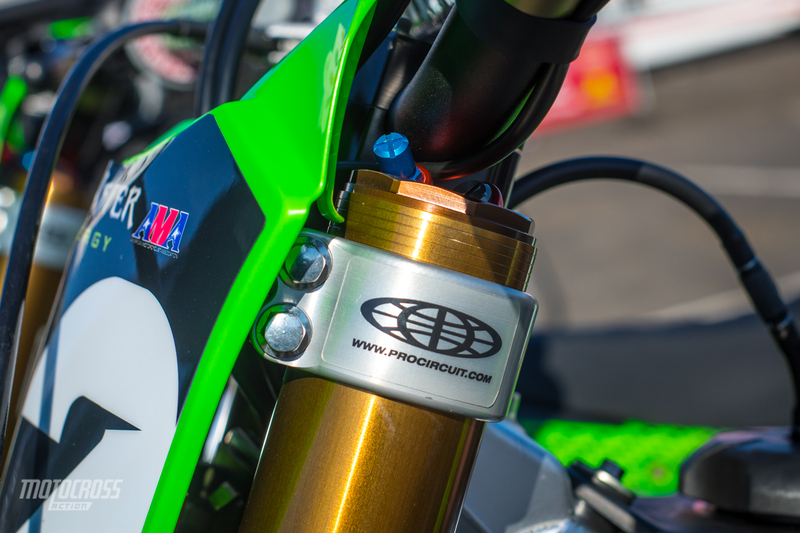 The color of the Pro Circuit KX250 teams bottom fork legs are b-e-a-utiful. 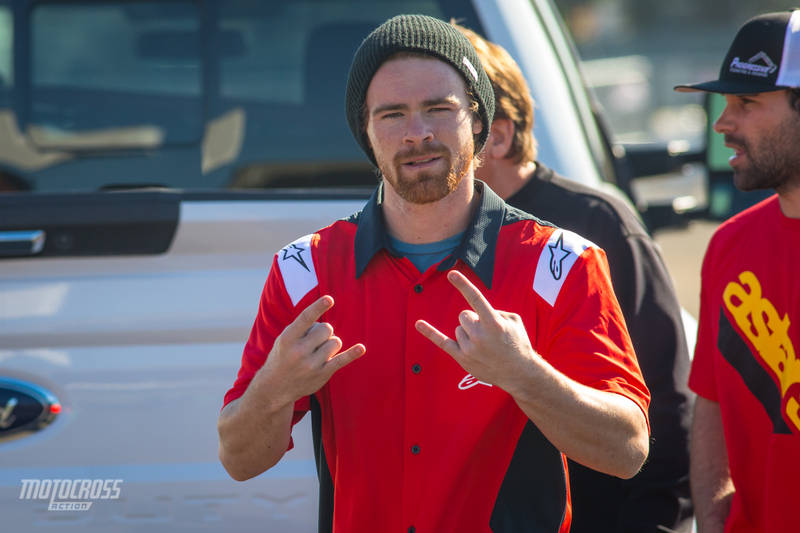 Colt Nichols has a two point lead on Shane McElrath going into the fourth round in Oakland. 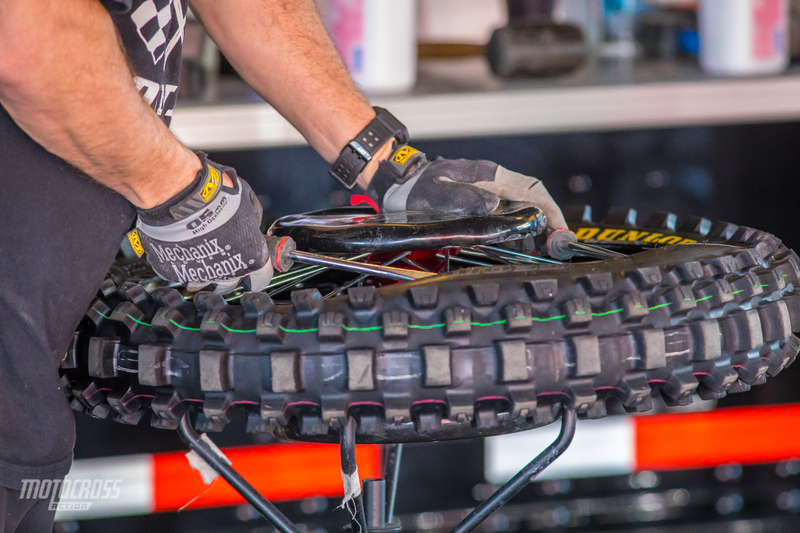 The Dunlop guys were busy. 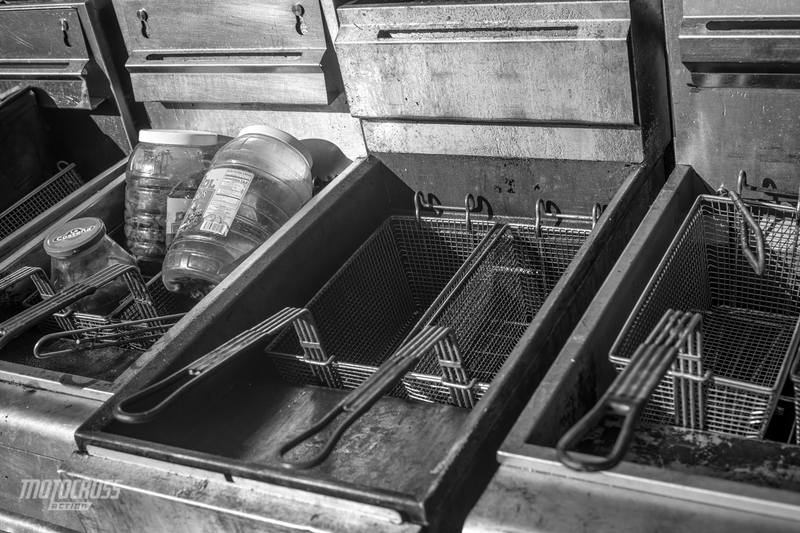 The fryers are getting ready for the crowd. 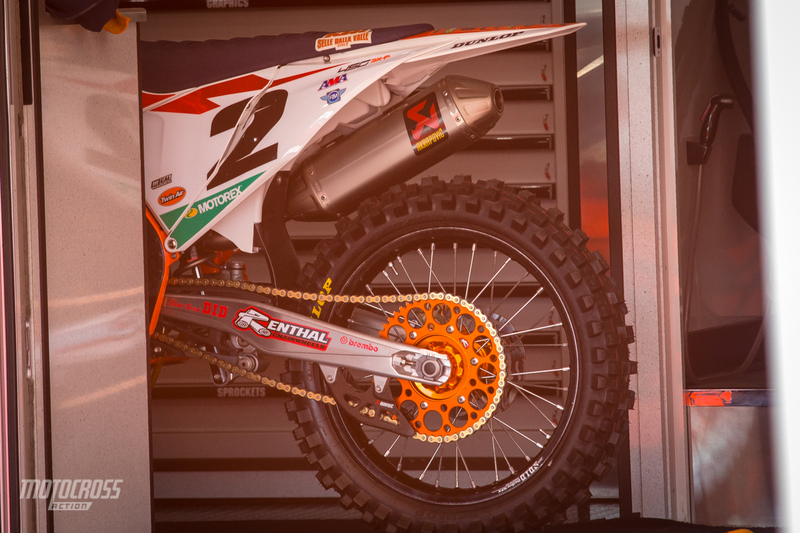 Jess Pettis’ Canadian factory KTM 250SXF. 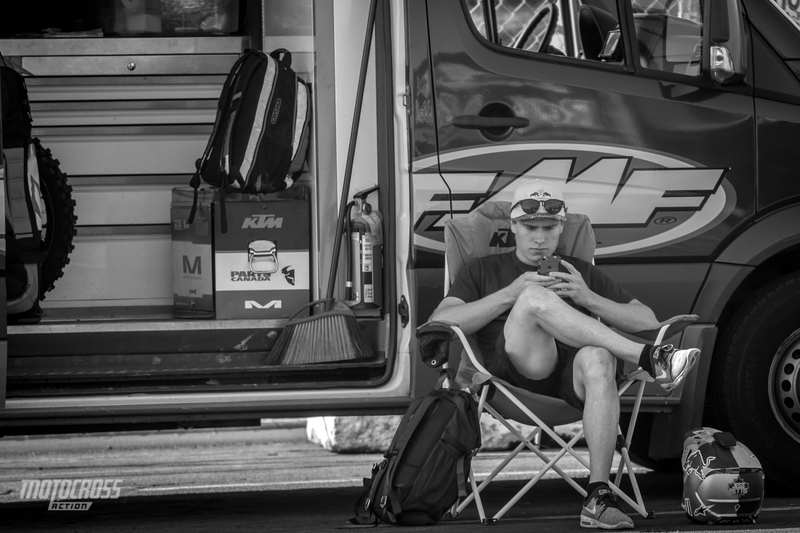 Jess Pettis hangin’ out at his sprinter van. 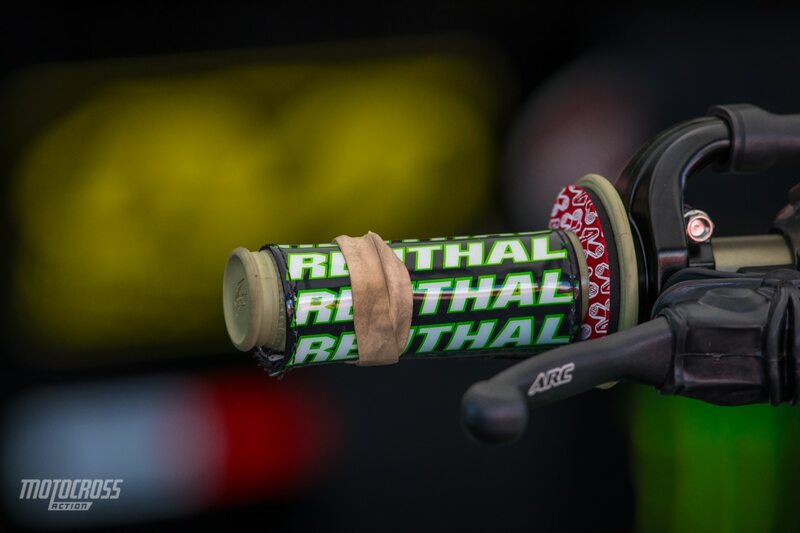 The Velcro wore off the Renthal grip saver so a rubber band keeps it on. That is our version of it at least. Ted Parks is a happy guy. 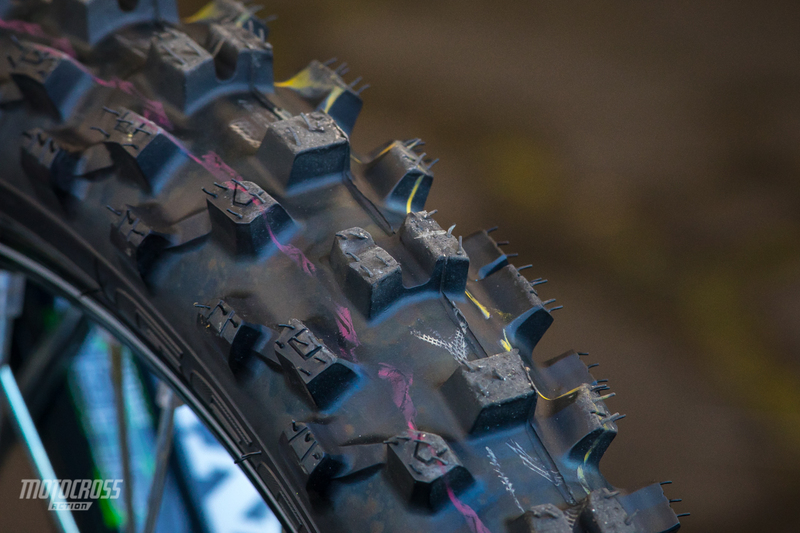 Up close and personal with factory tread. 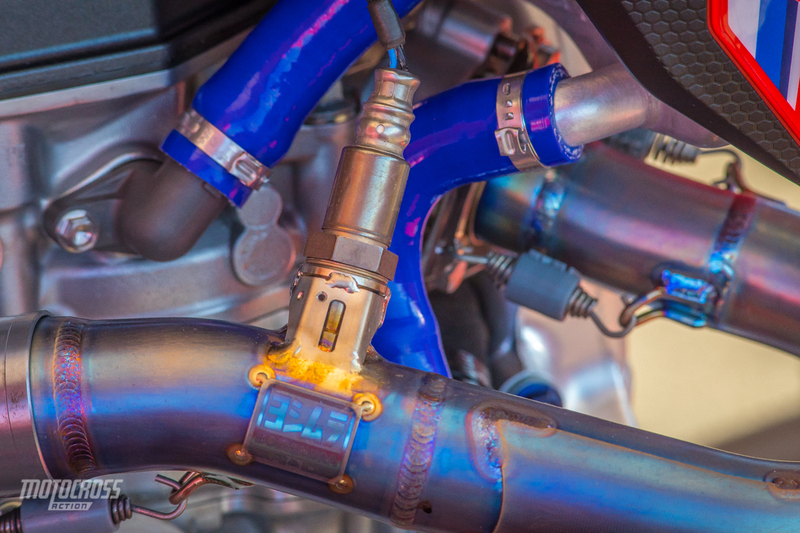 Teammates using different suspension. 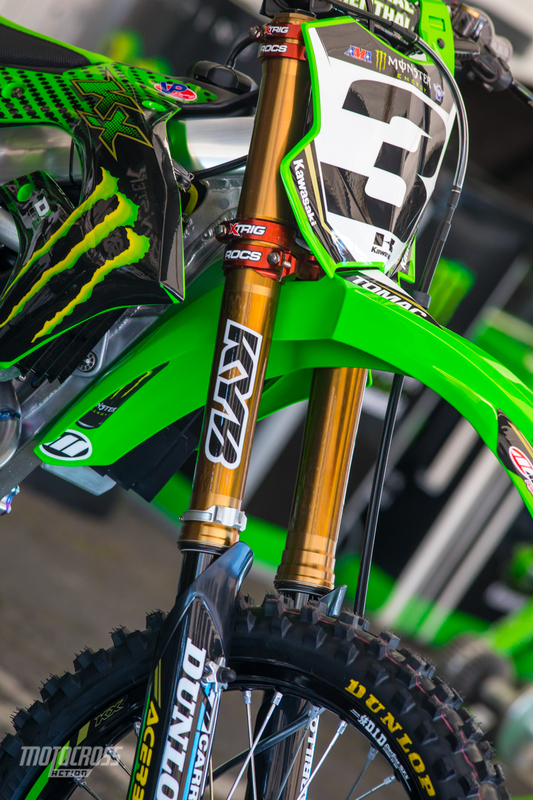 Eli Tomac chooses KYB. 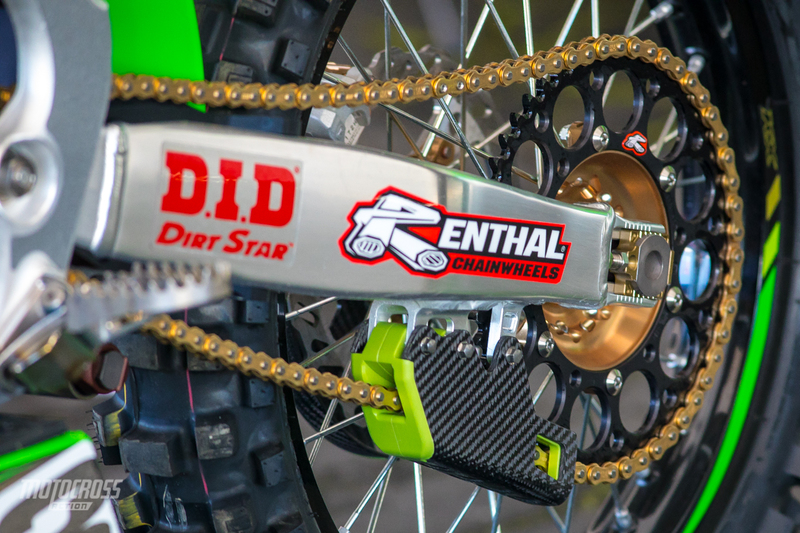 Both the Pro Circuit riders, Adam Cianciarulo and Garrett Marchbanks run their forks high up in the clamps. 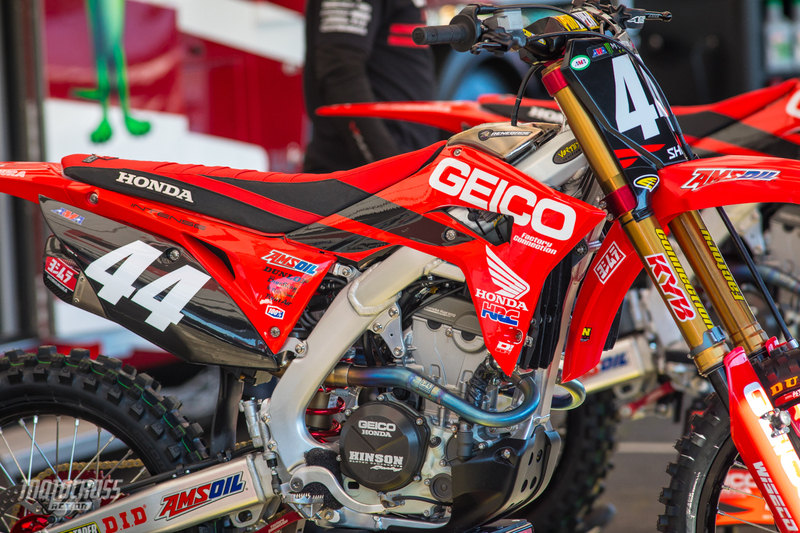 Cameron McAdoo’s Geico Honda CRF250. Remember Colin Morrison? 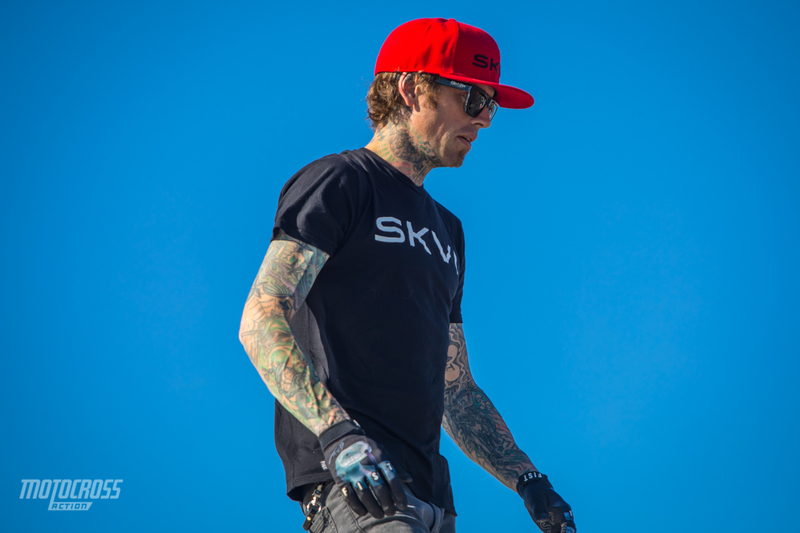 The Metal Mulisha freestyle rider. 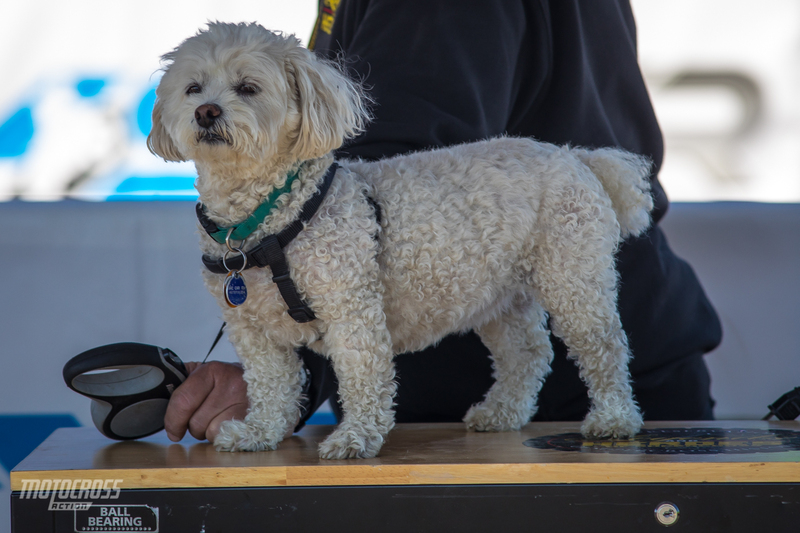 He helped put together the SKVI Supercross team for 2019. 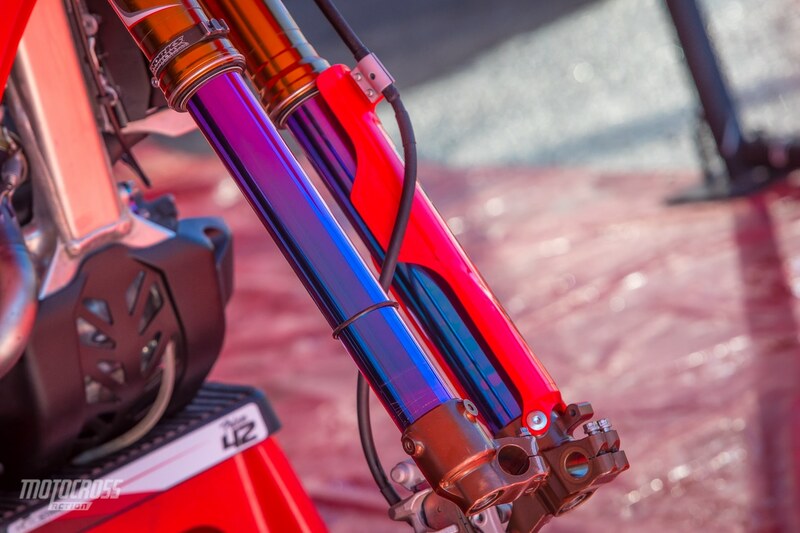 More awesome colors on the Smart Top Honda riders bikes. 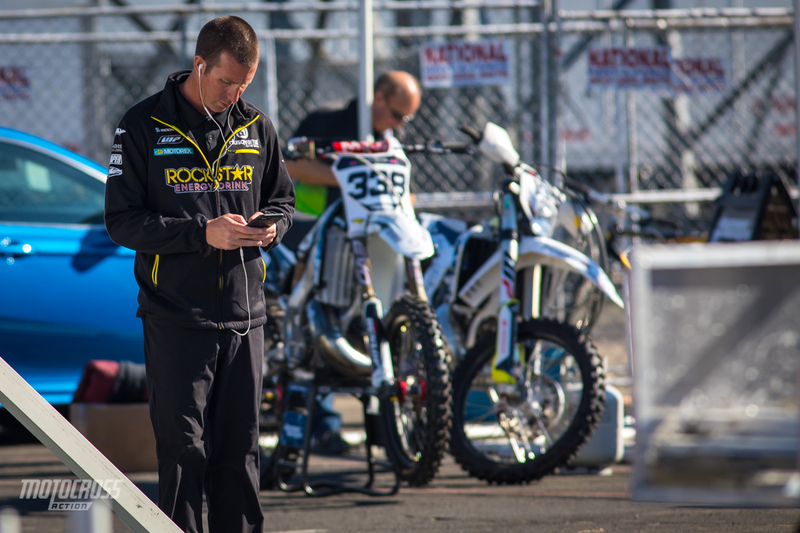 Alpinestars’ Justin Muscutt takes care of the boot needs of A-star sponsored riders. 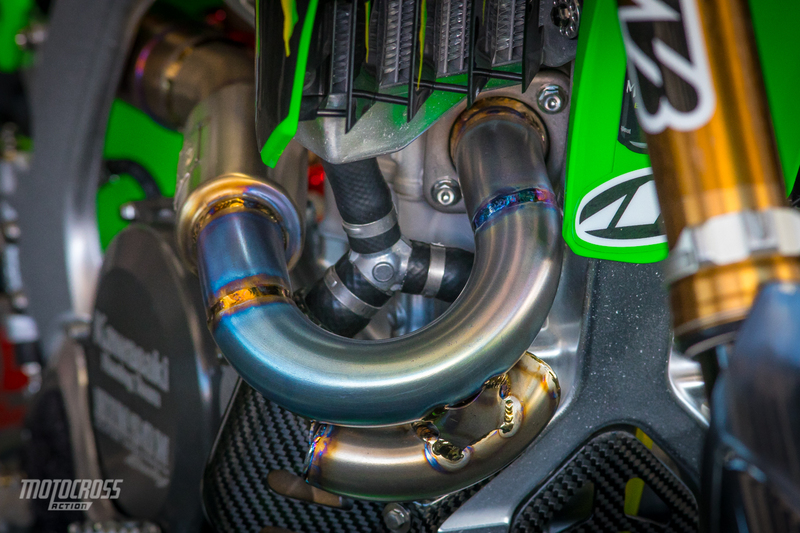 The factory Kawasaki team has an assortment of different Pro Circuit exhausts to choose from. 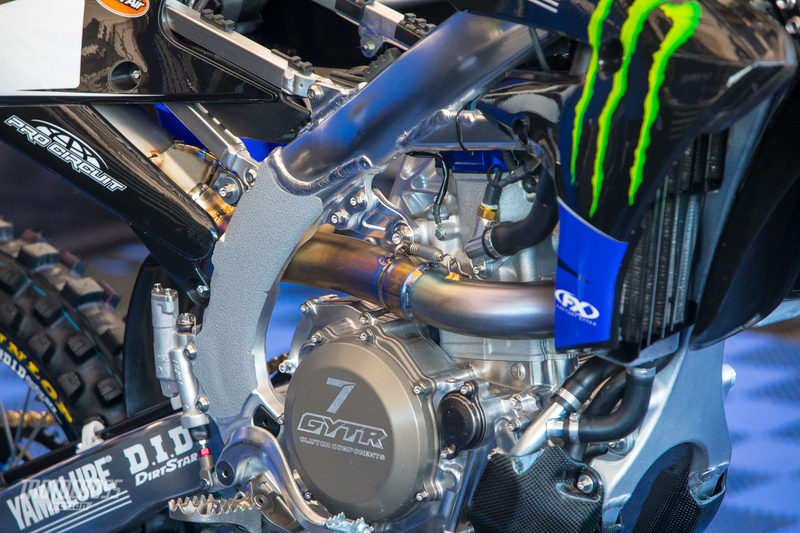 Yamaha is trying to put more weight on the rear end by turning the tank around and moving it further rearward. 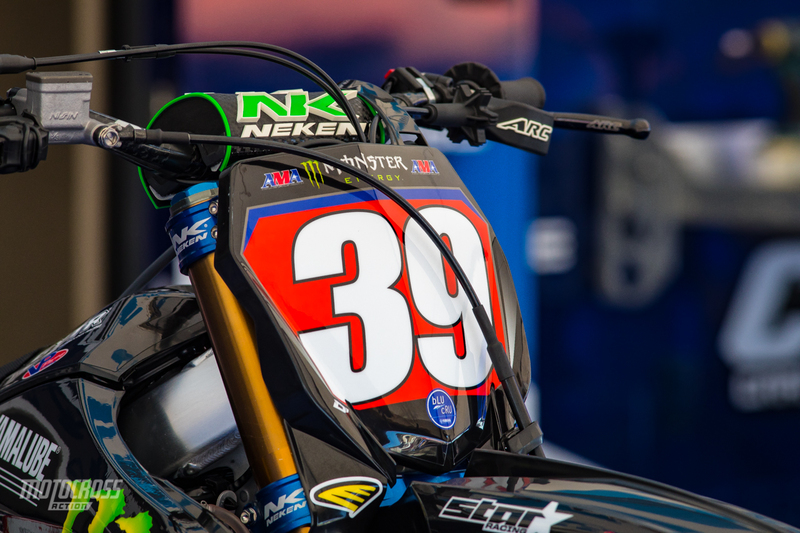 Aaron Plessinger is running what looks like a fork telemetry system that records data for the team. 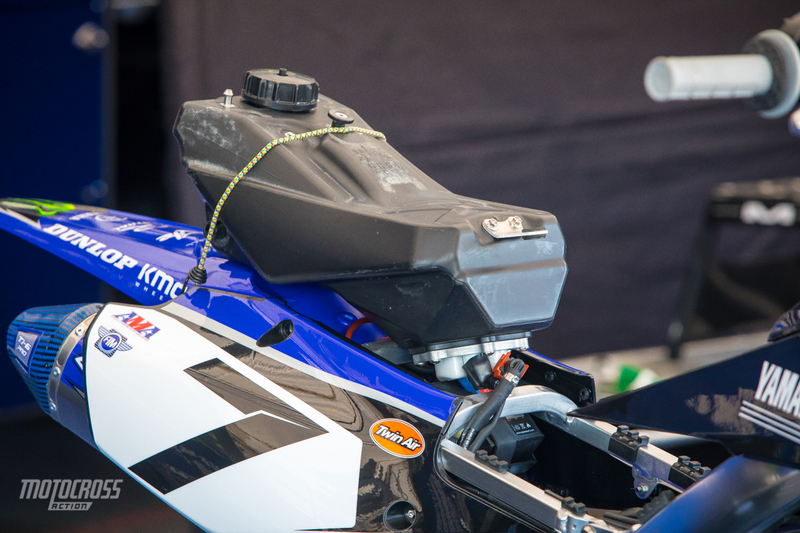 We tried to get a closer look at it but the Yamaha guys didn’t seem to want us to see it. 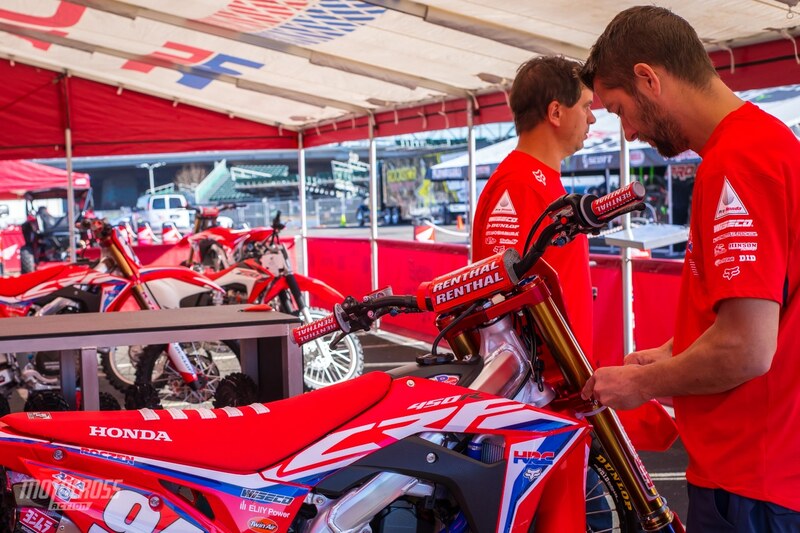 Lars Lindstrom putting the finishing touches on Roczen’s machine. 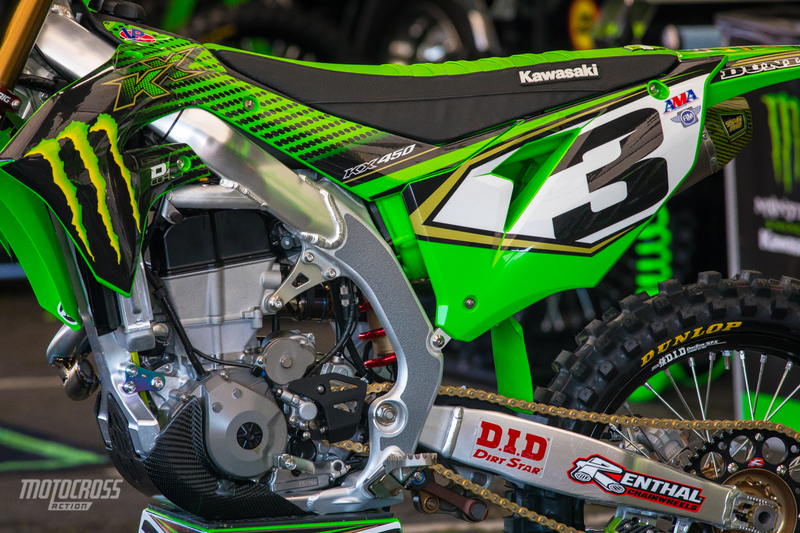 Eli Tomac’s factory Kawasaki KX450. 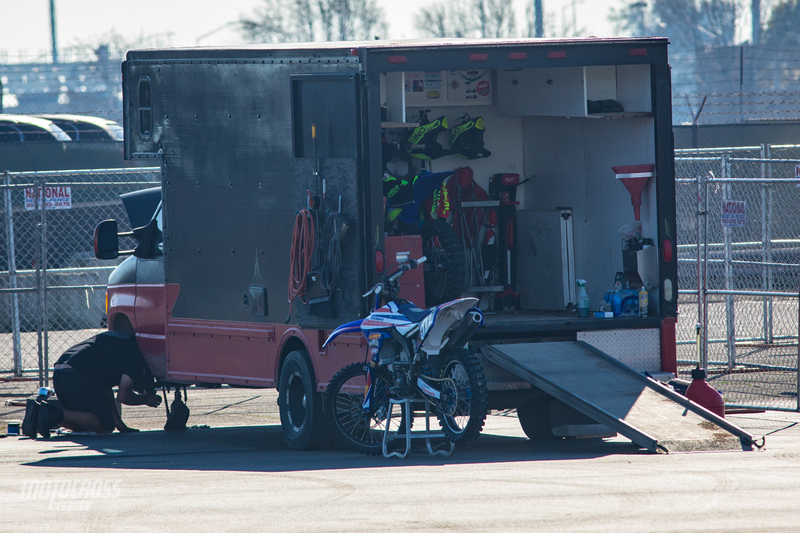 This privateer had a rough day to the track. 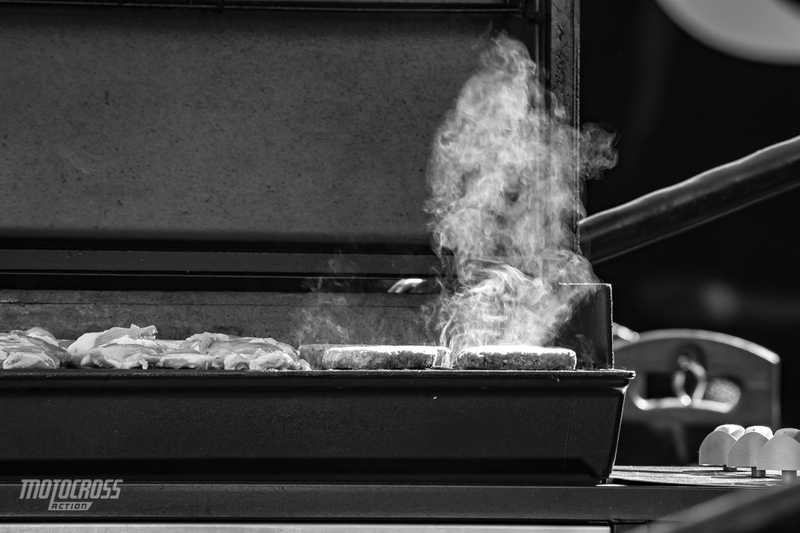 Steve Westfall finding the perfect playlist to fit the Oakland atmosphere. 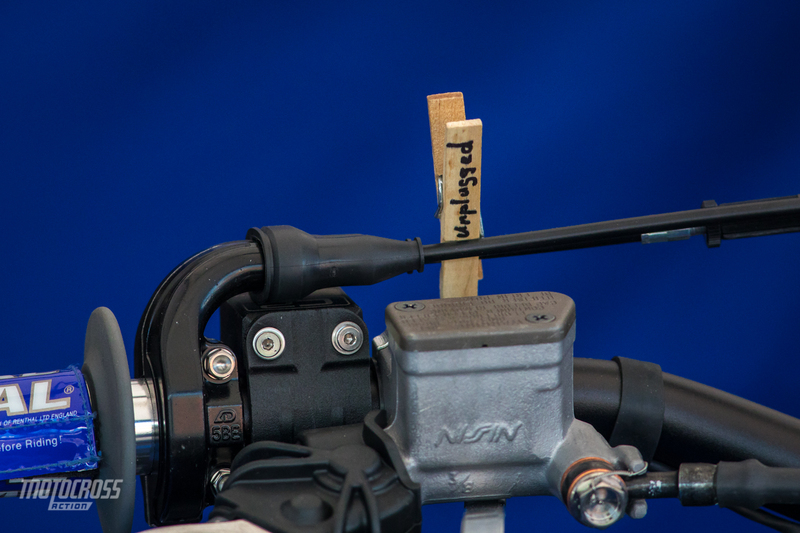 This is one fine piece of Pro Circuit welding. 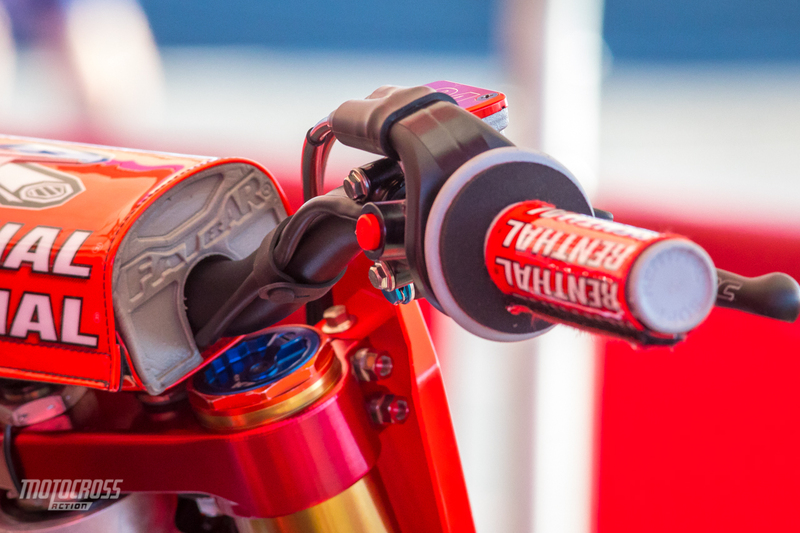 Up close on Roczen’s Lamda sensor that tracks the amount of air and fuel per exhaust. 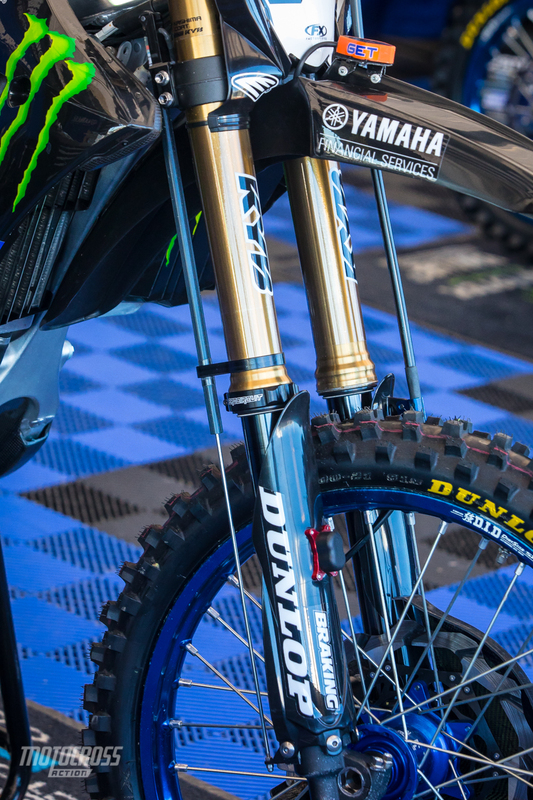 The gold hubs match the gold D.I.D chain on Savatgy’s bike.